when i began my christmas advent calendar, playing along with graciel's suggestion, it was important to me to keep it current. to not go back and use older images, to stay in this christmas moment. it was just for me, something i did for myself, and i mostly succeeded, if you don't count that sly peeping angel of emma's. i went out for a walk this morning, thinking to take christmas pictures, but it was a shorter walk than i'd planned, it being much colder than i'd anticipated, and i took few images. i mostly kept pulling my sweater tighter around me and wishing the wind wasn't blowing in my face as i turned toward home; those of you who live where it is cold and snowy will laugh - i understand and i laugh right along with you, but nonetheless, i was done with the outdoors unless i bundled up more. instead i chose to drive around and look for something cheery, but it is a gray day and though i did find myself on harmony street several times, a good sign if you pay attention to the word and ignore the street, i finally just headed on to the business and lilycat and some warmth. hence this image. and so christmas is she and i, and a heater next to my feet, the central heat on a timer that lets the weekend air go quite cool; i keep getting up and overriding it when it gets too cool - i have no idea how to totally change it - and then i am back with lily and we are kindling, which is my new verb for reading from my kindle, which sounds especially nice with coldness outside. we are almost through the land of the blue flower and we are waiting for the ever wonderful. the phone is mostly silent and downtown is deserted. Lilycat's a beauty & that, actually, sounds like a pretty yummy way to spend the day! Lilycat does look cozy, so I will imagine you there too. Merry Christmas to you! just the BEST image of the lilycat! you helped make this christmas season more beautiful for me. i thank you from the bottom of my tinsled heart. 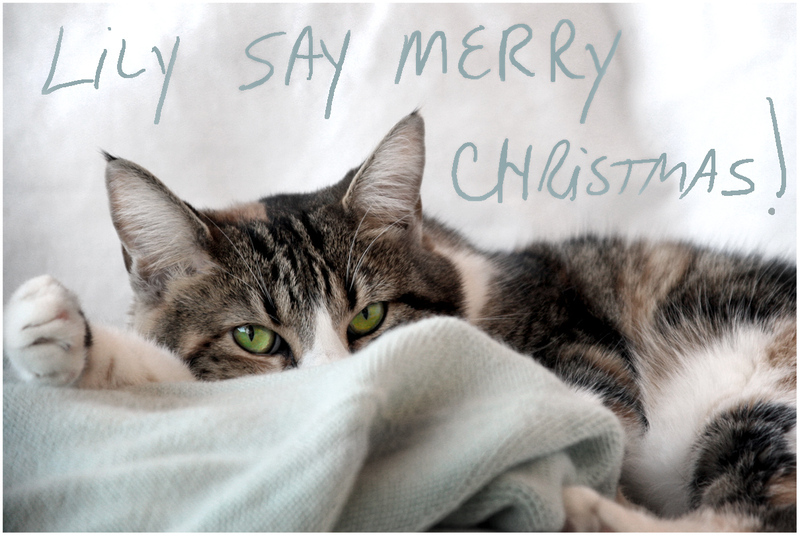 merry christmas to you and the ever-wonderful and that cat. oh, that cat. and just like that it's over....and i sit back and smile. perfect, you and lily, kindling. and how perfect is the title of that book? a lovely peaceful filled with perfect pretty images christmas. oh my what ever was on miss lilycat's mind...??? i so very pleased to have found your blog this sunday morning...thank you for sharing your talents! Merry Christmas to you and your lily kitty! It sounds like you both are having a nice, quiet, relaxing holiday. I'm looking forward to catching up with your posts this week. Oh! This past weekend, I came across two pieces that you wrote and which have been published in two separate magazines. Congratulations! What a beautiful picture of Lily! You can see so many thoughts in her eyes. I too laughed at the "pulled my sweater tighter" reference, a sweater is usually layer number 3 of 4 or 5 up here in the frozen North of the 49th Parallel! :) Best wishes to you both as you Kindle and cuddle. I haven't warmed up to the idea of having a kindle...don't know if I will ever go down that road, but I LOVE that verb you created...kindling. LOVE that. Almost makes me want to change my mind and go get one so I can do that. Almost. Lily has the most gorgeous green eyes. So beautiful she is...I am so glad you shared Christmas together...and the ever wonderful, of course.